Join us Sunday, December 8th from 12-5pm for the 3rd Annual AS220 Industries Holiday Sale, featuring work by members, staff, residents, Youth Studio members, and instructors at AS220. 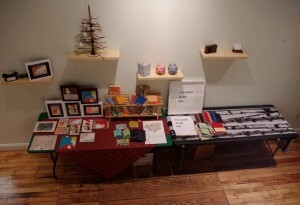 The sale takes place in the Main Performance Space at 115 Empire St. In addition to all of the beautifully-designed and crafted objects for sale, there will be 3D Printing demos, photos with Santa, and a raffle! F(OOD) will be closed, but The Bar will open at 3pm.